As a vegetarian that still allowed fish into my diet and a 16 year old this was the perfect job. I could sneak all the fried shrimp I wanted when the boss was in the office in the back. But my real treat was the hush puppies. I loved when customers asked what hush puppies were. I would say “It’s garlic flavored cornbread, deep fried”. Almost every single person I told that to, ordered them. And I don’t blame them. Hush puppies are fried, but light and airy. A vehicle for a myriad of sauces that begins with tartar and can end anywhere your little heart desires. Truth be told I don’t think I have had a hush puppy in 20 years (even though I’ve lived in the south for over a year) and it’s a damn shame. Considering the temperature is under 20 degrees and I’ve got a crock pot full of chilli I decided it was time to resurrect the hush puppy. It helps that I have just happened to discover the best corn meal I have ever used from right over the mountains in North Carolina. Crooked Creek Stoned Ground Corn is the most amazing stone ground white corn meal I have ever tasted. From the best corn bread ever to breading and frying anything I knew it would not disappoint as a hush puppy. Corn Meal, Flour, spices, baking powder and baking soda. 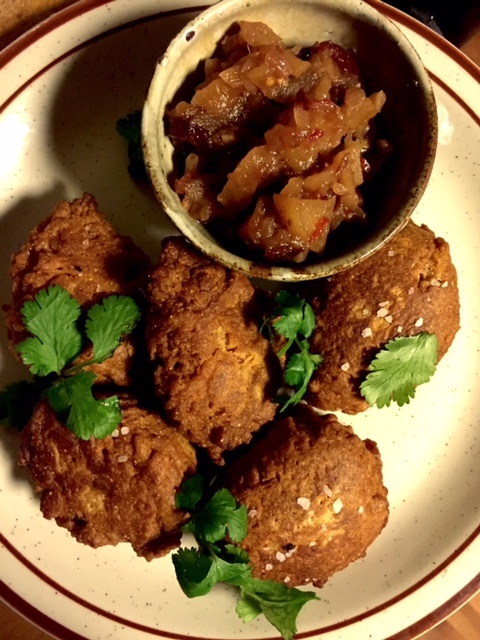 This Indian twist on a traditional Southern treat comes from my love of curry and spices and my excess of dried peppers of seasons past. Hush Puppies were everything I remembered them to be, light, airy, salty, sweet, crunchy and soft all at once. Another great accompaniment if you don’t want to make the chutney is to simply make a raita as a sauce, sort of a play on the traditional tartar sauce. First add olive oil to a small saute pan and heat. Add diced onion. when onion is coated in oil and just starting to sweat, add curry, turmeric and cumin spices. Saute until very fragrant but not burned. Mix all other dry ingredients together well with a whisk. Beat 2 eggs with half and half. 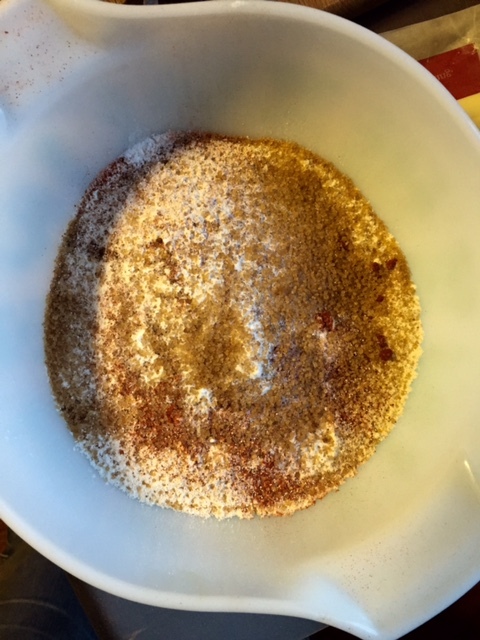 Add egg/half and half mixture to dry ingredients. Stir until just combined. Let sit one hour. Heat a few inches of grape seed oil in a cast iron skillet. When the oil is about 350 degrees begin to spoon in drop of hush puppy batter, about 2 tablespoons at a time. Brown on all sides, salt and remove to a paper towel to drain. Combine all ingredients except water in a small saucepan. Add water to just cover. Simmer on low about 25 minutes, adding water as needed if ingredients become dry and start sticking to pan. Chutney is ready when all ingredients are cooked through. Adjust salt to taste and add a touch of maple syrup if it’s too vinegary or bitter. 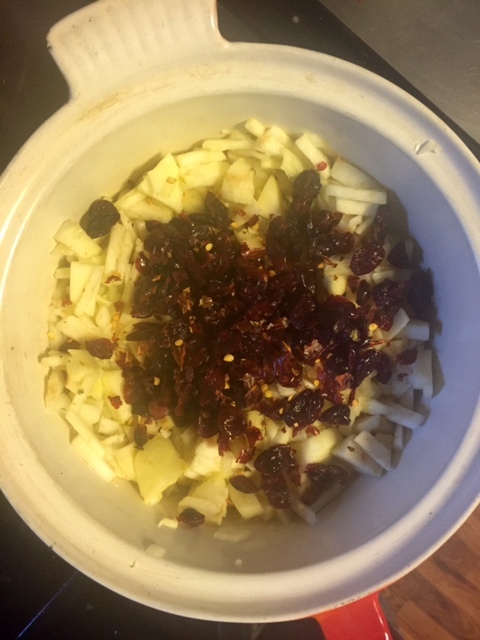 Apples, cranberries, onion and garlic simmering away. What do you kids know about Arthur Treacher’s Fish & Chips? Nothing? That’s what I thought. Well, I am just old enough that working at Arthur Treacher’s Fish & Chips was my first real 16 year old job. It was in the Galleria Mall Food Court in Buffalo, NY.